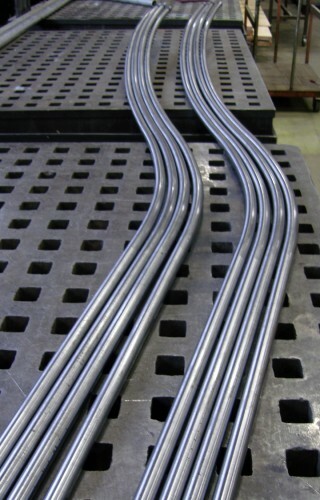 Unraveling strands of steel pipe create a clothing display and focal point for the tony boutique. Flatcut, a design and fabrication firm with a studio in Brooklyn and a 100,000-square-foot facility in Passaic, New Jersey, has more than 100 machines to its name. Though it has the capabilities to mass-produce 20,000 custom furniture pieces and 50,000-square-foot facades, the firm also creates small, site-specific installations for museums and retail stores. Most recently the Beckley Boutique, a celebrity hot spot and shopping destination on Melrose Avenue, hired Flatcut to design an eye-catching design feature at its new Las Vegas outpost in the Cosmopolitan Resort and Casino. With its Arquitectonica-designed façade, the Cosmopolitan has interiors by Rockwell Group, Jeffrey Beers, and Adam Tihany; the hotel’s retail stores wanted to stand out, too. Beckley envisioned a functional sculpture at the store’s entrance to showcase its eclectic mix of emerging and established fashion designers. Flatcut had already worked on the store’s Melrose flagship, so the firm was a natural choice to design a new feature. 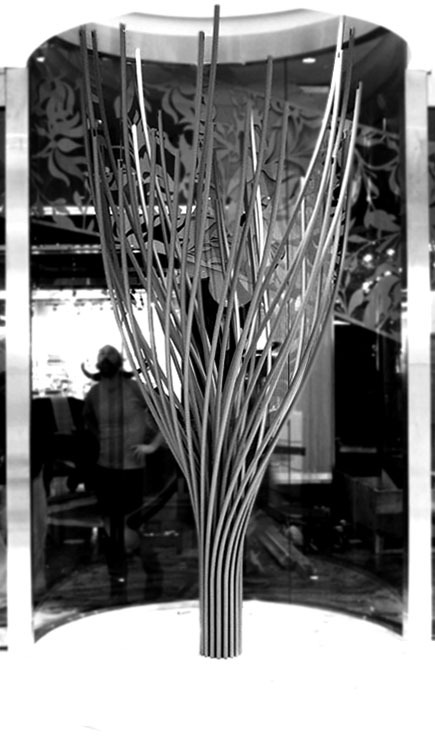 Rather than produce a literal translation of a retail “tree” (like the one that stands in the Melrose store window), Flatcut abstracted the design into bunches of unraveling strands to create a dynamic shape that would attract hotel and casino patrons while also setting off the boutique’s wares displayed prominently in the storefront. 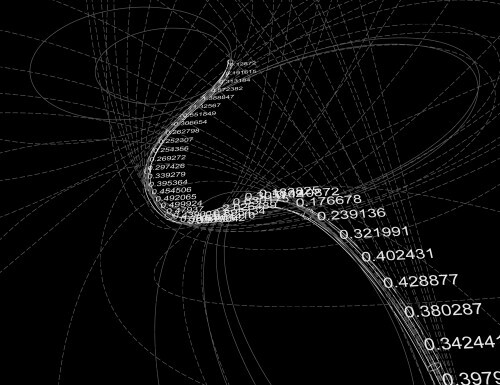 The design was developed parametrically to establish an iterative process capable of creating multiple variations in a short period of time. The firm’s custom software is capable of reading a series of radii and lengths taken directly from the 3-D model. This results in a highly accurate translation process, with little opportunity for human error. The tree’s strands are made of one-inch outside diameter light-gauge steel tubing pipe bent by a three-axis CNC pipe bender. The sculpture includes a total of 36 custom strands designed from three different curves and cut at 12 different lengths, creating a swirling, centrifugal design. 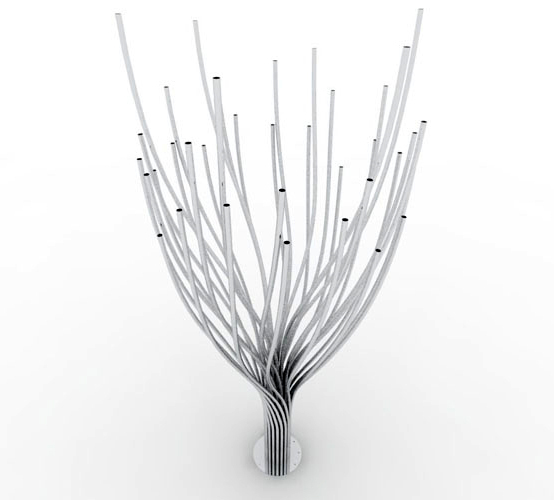 Notches at the top of each branch can hold hangers or accessories. 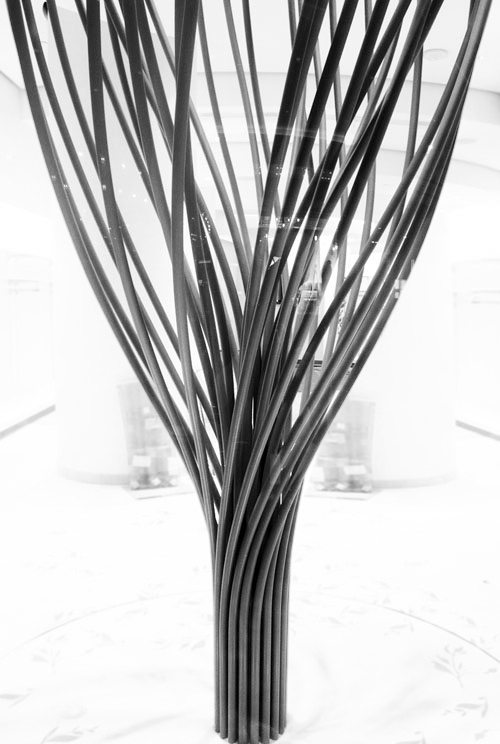 Though the installation stands only 10 feet tall with a diameter of five feet, it holds its own among the hipster clothing and stands out in newly design-centric Las Vegas.